Animate Pro is set to the digital sound scrubbing mode by default. This means that all sounds are played in real time. It also means that as you scrub over a frame you will hear the section of your sound file that is allotted to that frame. As you are scrubbing, although it is accurate, the sound can sound clipped. It can also be difficult to hear nuances in pitch and tone. Animate Pro has an analog sound scrubbing option. When sound scrubbing in this mode, the sound is played back according to the speed that the playhead or jog is manually adjusted. Animate Pro's interface offers shuttle and jog sliders to perform analog sound scrubbing, however, external hardware and their corresponding software can be used in conjunction with Animate Pro for improved analog sound scrubbing results. Please refer to the device's manual to configure its functionality with Animate Pro. 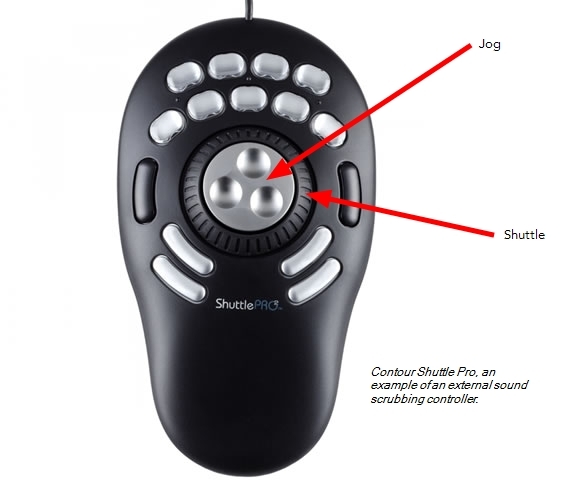 Before you can perform an analog sound scrub in Animate Pro, you have to learn about the Shuttle and Jog. • Shuttle: Pull the Shuttle backward or forward to make the red playhead, in the Timeline view, jump by large increments in the direction you are moving the shuttle. • Jog: Click and drag along the Jog to make the "dial" rotate. The Jog controls finer incremental movements along the soundwave. Use the Frame field to see the frame number which you are on. As you rotate the dial, your speed in fps appears directly after the FPS field. 1. In the Playback toolbar, click on the Sound Scrubbing button or from the top menu, select Play > Enable Sound Scrubbing. You can also activate Sound Scrubbing by right-clicking in the Timeline view's frame bar. 2. In the top menu, go to Edit > Preferences (Windows) or Animate Pro> Preferences (Mac OS X). 3. In the Sound tab enable the Analog Sound Scrubbing option. 5. In the Playback toolbar, use the Shuttle to find the general location of where you would like to start your sound scrub, or in the Timeline view, drag the red playhead to the desired location. 6. In the Playback toolbar, use the Jog to fine tune your scrub to just a few frames.